Jakarta Vice Governor, Sandiaga Uno conducts work visit to Boston and New York, United States of America, on June 24-30, 2018.
" Next year, Jakarta Government hopes curation training and participation on 'New York Now' can be continued and improved to support OK OCE program"
This work visit is done to fulfill invitation from Massachusetts Institute of Technology (MIT) Senseable City Lab. Director, Professor Carlo Ratti; Deputy Regional Director for North America and Head of New York Office C40 Climate Change Leadership Group, Laura Jay; and President of 100 Resilient Cities-Rockefeller Foundation, Michael Berkowitz. He is also scheduled to meet James Reginald Colimon as International Partnership Manager of Global Affairs in Mayor’s Office of Economic Development, Boston together with Dominick Aswini and Marisa Lago from New York City of City Planning Department. Jakarta Foreign Cooperation and Regional Head (KDH-KLN) Bureau Head, Muhamad Mawardi mentioned, meeting with MIT's Senseable City Lab team on June 25 is to get information and concrete picture about development of smart city technology that correlated with smart city concept progressing impacts. On the same day, Vice Governor is also met with Prof. Lynn from Global Resilient Center (GRC), Northeastern University. This chance will be used to convey about big city problem's solution related with public transportation. "Especially that relates with Intelligent Traffic System in Jakarta to reduce long line in traffic lamps in the future," he explained, Monday (6/25). As the additional event in Boston, he added, Vice Governor also meets with James Reginald Colimon as International Partnership Manager of Global Affairs in Mayor’s Office of Economic Development. Meeting schedule is to discuss about Jakarta Government experience in establishing foreign cooperation by joining multilateral cooperation and bilateral cooperation (sister city), and reviewing cooperation that can be made within sister cities. Furthermore, Sandi is scheduled to meet Consulate General of Indonesia (KJRI) in New York, Abdul Kadir Jaelani to appreciate and thank KJRI New York that has facilitated curation training on product enhancement and market opportunities in America for Jakarta IKM/UKM conducted by Jennifer Isaacton in 2017 and 2018 and Jakarta IKM/UKM participation that have been selected on 'New York Now Exhibition 2017'. 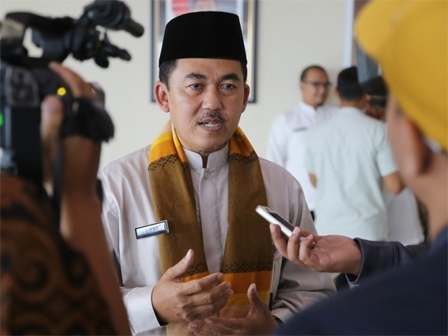 "Next year, Jakarta Government hopes curation training and participation on 'New York Now' can be continued and improved to support OK OCE program," he stated. He explained, Sandi and Deputy Regional Director for North America and Head of New York Office C40 Climate Change Leadership Group, Ms. Laura Jay have met to review about development for cooperation that have been done between Jakarta and C40 since 2009 such as carbon finance capacity building, City Hall Building Retrofit, carbon disclosure project report, greenhouse gas reduction workshop, and to support Jakarta plan towards 2020 Deadline Program'. On June 29, Sandi will meet with Executive Director to 100 RC, Michael Berkowitz to discuss about cooperation program between Jakarta and 100 RC such as Jakarta Resilient City program, and follow-up meeting between Jakarta Governor and Executive Director to 100 RC in 'Global Forum of Milken Institute' event held in Los Angeles this April about cooperation plan in water supply and sanitation, urban renewal/affordable housing, connectivity and mobility together with air quality impacts, and strengthen cooperation between Jakarta and hinterland countries in solving metropolitan cities problems. "During in New York, Vice Governor is scheduled to meet New York City of City Planning Department, Dominick Aswini and Marisa Lago with focus meeting about Hudson Yard Development success, Transformation of Industrial Areal to Affordable Housing," he stated. Beside formal meting with government institutions and international organizations, Sandi will also conduct field trip to New York Smart City, Dumbo (Settlement Area Revitalization), High Line (green space) and Governors Islands (green space).